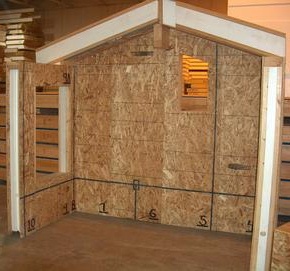 Home Builders - Let us bid on the Walls and Roof on your next house or commercial building. We are the Representative for SIPS Walls and SIPS Roof Panels. We can ship SIPS panels anywhere in the world. We want to give you a free price quote for your new building or new home. Our SIPS Wall System is Green Energy. We can save you time which means saving you money. A 2,000 sq. ft. house can be framed in one day. The walls and roof panels set in three days. Green Energy Safe Homes and Commercial Buildings are 2 1/2 times the added strength compared to regular stick frame building. An Enercept home located in the Florida Gulf survived Hurricane Opal in 1995 and was used as a meeting facility for the county rescue team. The same Enercept home along with another in Central Florida also survived the hurricanes of 2004! We work with builders. Please visit all the pages on our webpage to learn more about SIPS Walls. Let us bid on the Walls and Roof on your next house or commercial building - we give free price quotes.